It's a Small World Holiday is such a dazzling spectacle that it naturally lends itself to being the target of a camera's lens. Dealing with the drastic differences in illumination in any scene of this ride facade, though, is challenging. The lights themselves are wonderfully bright and provide plenty of lux for the camera to capture, but good luck trying to get detail in any other part of the same exposure. So for shots like this, combining multiple takes into a manual HDR is essential to really balance out the actual brightness that the human eye sees. I shot this photo from a more oblique angle to get the tree framing the upper left corner. It's not quite the panoramic, sweeping overview as last year's angle, but I still like it! 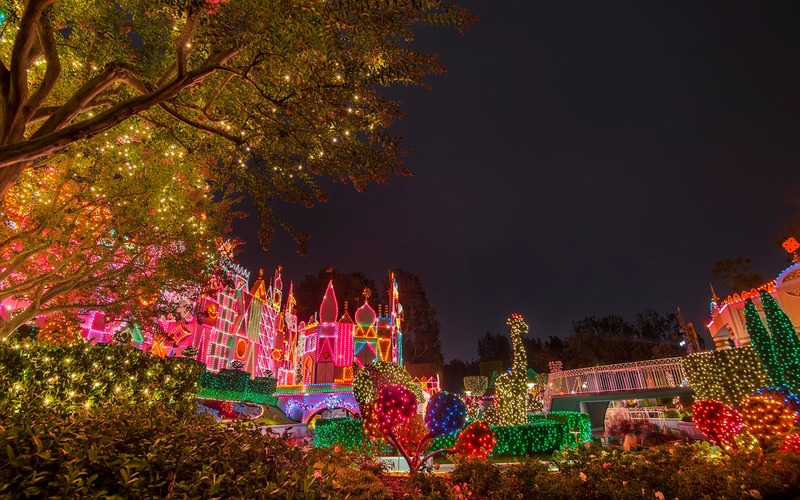 The colorful, saturated glow of It's a Small World Holiday.